When Audible relaunched Audible Channels for Amazon Prime users, the cover art system was rebranded to make the content have a more premium, magazine cover-like appearance. The cover art and branded needed to showcase the quality of Audible exclusive short form content. Channels topics range from comedy and short fiction to history lectures and audio news. Audible and Amazon Prime listeners can get access to original series and handcrafted playlists. To provide a sense of continuity across the varying cover art, a system of badging was created to live on Audible Originals art. A variety of shapes and positions were tried that would fit within the unique cropping situation that occurs within the Audible app. Outside of the app, the plain text logo is seen above the show title, but for use within the app, show art has the badge to provide the unifying element. The playlist made out of the top listens of the day on Audible Channels is Trending. Various concepts were explored to give this non-specific topic channel its cover art, but the one chosen lends itself to the idea of very talked about topics. I gathered concept ideas and did rough drafts as well as created the final art. 100:1 The Crack Legacy explores the direct connection from the war on drugs to today's police brutality against the black community. The concept that I proposed featured a lineup of cops facing a Black Lives Matter protest. Although the version that I helped art direct (seen here) didn't make it into the final version of the app, we finished the render of it and a similar piece of art replaced it. The Home Front with Martin Sheen was released to commemorate the 75th anniversary of Pearl Harbor and takes a look at life in America during World War II. Art was created by Matt Mahurin based on concepts and mock ups. I also did final edits and logo design. 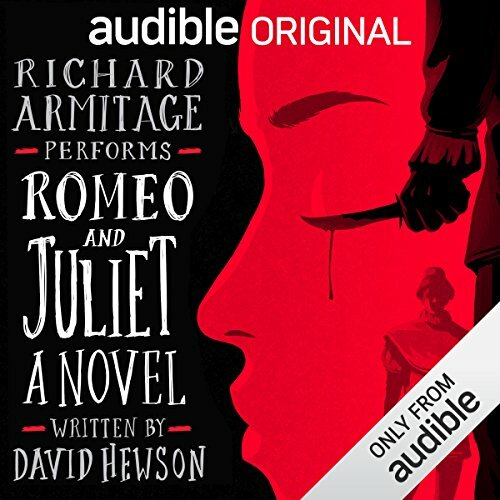 Adding to Audible’s growing collection of exclusive audiobooks and celebrity narrations, David Hewson’s Romeo and Juliet: A Novel reimagines Shakespeare’s tragedy. Audible commissioned artist Levente Szabo to illustrate the cover. To maintain the aesthetic of the illustration and Audible’s signature “unleashed” typography, I hand wrote the copy for the cover. I personally received praise from the book's author, David Hewson, and the narrator, Richard Armitage, for my work on the book at a cover reveal party.